The Adventure Pass includes access to download episodes six, seven, and eight, as they become available. These new episodes continue the story of the New Order of the Stone, following Jesse and the group as they explore uncharted worlds beyond their own. 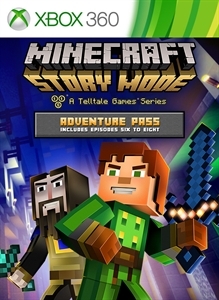 Requires purchase and installation of Minecraft: Story Mode - Episode 1: The Order of the Stone; not included in the Adventure Pass.